VANCOUVER, Wash. - Visit Vancouver USA has announced the American Empress as the recipient of the 2017 Spirit of Tourism Award. Presented in conjunction with National Travel and Tourism Week, the award recognizes the achievements of an individual, business, attraction or event that contributes to the economic vitality of the region by attracting tourists to the area. "We are so thrilled to be the recipient of the 2017 Spirit of Tourism Award. American Queen Steamboat Company has been a part of the Vancouver community for the past three years, and our guests truly love this area," said Ted Sykes, American Queen Steamboat Company president and COO. "There&apos;s no better way to start a relaxing trip along the Columbia and Snake rivers than after being warmly welcomed by this great city and its residents." Since 2014, the American Empress has homeported at the Vancouver Landing, bringing thousands of visitors from around the world to Vancouver for nine-day cruises on the Columbia River. More than 1,000 hotel rooms are contracted annually for the riverboat&apos;s overnight guests, resulting in an estimated economic impact that regularly exceeds $1.5 million. 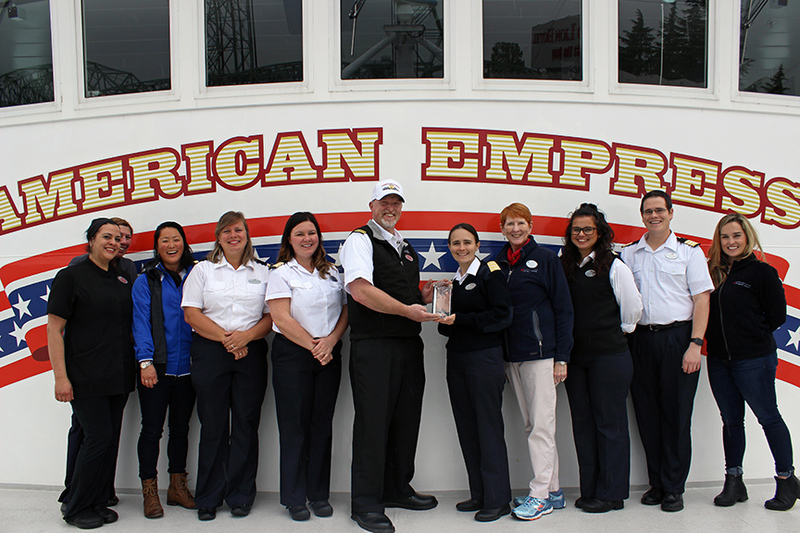 "The American Empress has an impressive track record of attracting visitors to Vancouver USA and sharing with them the rich history of our community," said Kim Bennett, president and CEO of Visit Vancouver USA. "As Vancouver continues to grow as a waterfront destination, riverboats and cruise ships such as the American Empress will help fuel further tourism to the area." The economic impact has also extended beyond the traditional tourism tenets of lodging, retail and dining. The riverboat has an approximate crew capacity of 83 workers, including local residents hired as the result of job fairs held in the area. Additionally, crew members have relocated to Vancouver from sister property riverboats on the Mississippi. The American Queen Steamboat Company also maintains a local office at the Port of Vancouver USA. Cruises run March through November, and past shore excursions have brought guests to Fort Vancouver National Historic Site, Officers Row and downtown Vancouver, depending on the riverboat&apos;s route and schedule. The Spirit of Tourism Award is awarded annually by Visit Vancouver USA. Recipients must have a demonstrable history of innovation, leadership and collaboration, specifically in one or more of the following categories: attracting visitors, assisting visitors and promoting Vancouver as a tourism destination. Past award winners include Vancouver Farmers Market, Vancouver USA Marathon, Ke Kukui Foundation and Fort Vancouver National Historic Site. supported more than 4,450 travel industry jobs. The full impact of the travel industry is highlighted with this year&apos;s National Travel and Tourism Week (NTTW)-now in its 34th year. Occurring the first full week in May, NTTW bring communities together nationwide to showcase the impact of travel to policymakers, business leaders and local media with rallies, events and other activities. This year&apos;s theme is The Faces of Travel, and shines a spotlight on the people behind the industry. To learn more about the tourism industry, please visit www.VisitVancouverUSA.com. Download a high-res image of the 2017 Tourism Award here. Download a high-res image of the American Empress crew here. Download a high-res image of the American Empress riverboat here. Visit Vancouver USA is the official destination marketing organization for Vancouver USA and the surrounding areas. The organization also markets the region as a venue for sports events through the Vancouver USA Sports brand. Visit Vancouver USA&apos;s mission is to increase visitor spending in Vancouver and Clark County through competitively marketing the area as a destination for meetings, conventions, and group and leisure travelers. For more information call 360-750-1553, or visit www.VisitVancouverUSA.com.